Larne Abse Gogarty and Dave Beech discuss his feature, On Ugliness from Art Monthly’s March issue. They also discuss Larne’s book review of Dark Matter: Art and Politics in the Age of Enterprise Culture by Gregory Sholette, Pluto Press 2010 in the same issue. This entry was posted in Art Monthly Monthly and tagged abject, abjection, adorno, beauty, Beech, body politic, Dark Matter: Art and Politics in the Age of Enterprise Culure, dave beech, David Beech, Foucault, Frankfurt School, Gogarty, Larne Abse Gogarty, Mark Cousins, stained, the abject, the counter promise of beauty, trauma, Umberto Eco. 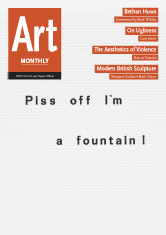 On Ugliness on March 15, 2011 by artmonthly.